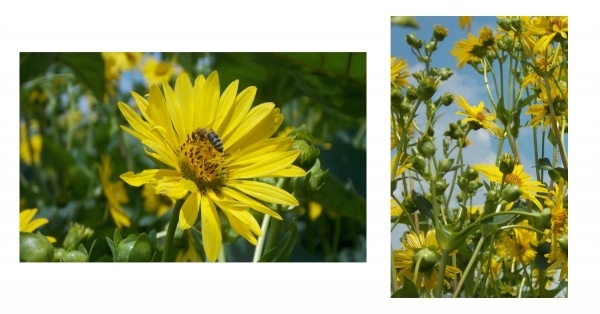 Pollinators are an asset on the farm. A pollinator is an animal that moves pollen from one part of one flower to another part of the flower (stamen to the stigma). This is nessescary to produce flowers or seeds. Insect pollinators include bees, wasps, ants, butterflies and moths and certain beetles. Hummingbirds are also common pollinators in Southern Ontario. 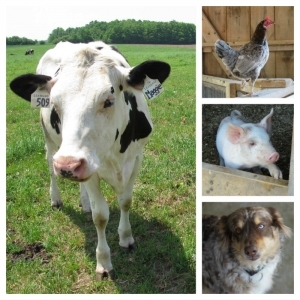 At Mapleton's we see the farm as an ecosystem where everything is connected. Therefore, we have planted bufferstrips and windbreaks. Only native species are used for planting in order to support wild pollinators and other creatures. The image above, is a buffer strip that is between two fields that are currently planted in hay. Unfortunately, we lost the trees in this windbreak when they were hit by a tornado. In this photo taken during the last week of July, you can see the variety of plants and colours in the strip. Below, is a windbreak that is full of trees between two fields currently planted in corn. Notice the grasses and how the break meets up with bush to create a safe passage for wildlife. We have windbreaks that surround the farm. These windbreaks were planted no more then 30 years ago. They started out with basic species but are now full with vibrant wildlife. Once the insects move in, they will cause the flora to flourish which will then bring the birds and small animals. Windbreaks are big factors in soil erosion. We rely on our windbreak to slow down the wind to reduce the chance of the soils being blown away by the wind. The best windbreaks allow the wind to pass through it while slowing down the wind speed. Some windbreaks are planted solely with evergreens. These breaks are thick and do not allow the wind to pass through. The wind passes over the top and hits the land again at the same speed. Windbreaks can also directly influence a crop yield. 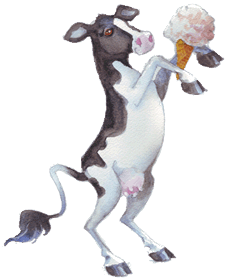 By changing the wind velocity, the break will help keep the moisture in the land and will prevent the soil and crop from drying out. 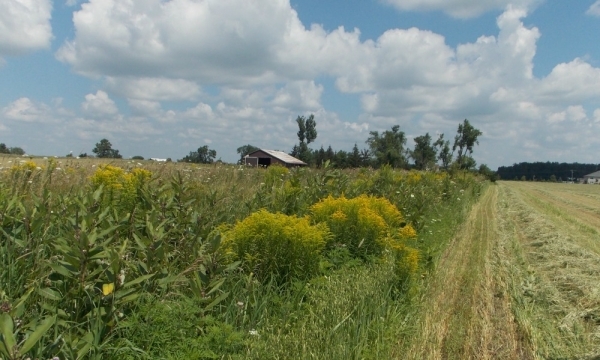 On many farms, these natural areas have been pulled out to create more space for cropping. They can be viewed as messy and a pain to navigate with large equipment. We encourage both farmers and gardeners to plant natural areas. A diverse assortment of shrubs, trees and grasses is needed to create a welcoming habitat, first for insects and then for wildlife. We believe that we could positively impact the ecosystem on every farm if we were all willing to dedicate 2% of our land to natural spaces. 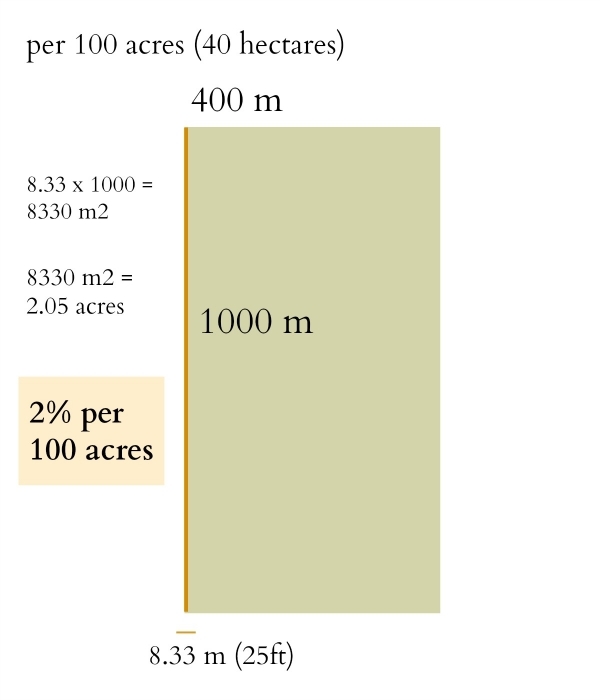 The orange strip on the left demonstrates the 2% of land needed to create a natural space. On 100 acres, using the dimensions of 400 m x 1000 m, a strip of about 8.33 m (25ft) would be all the land needed to create a sufficient windbreak. 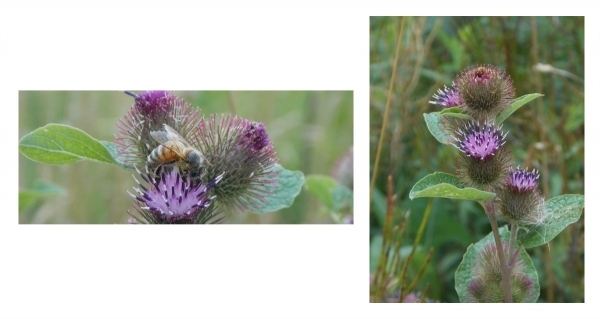 Below are just some of the images we have taken around our farm of plants and insects in early August. 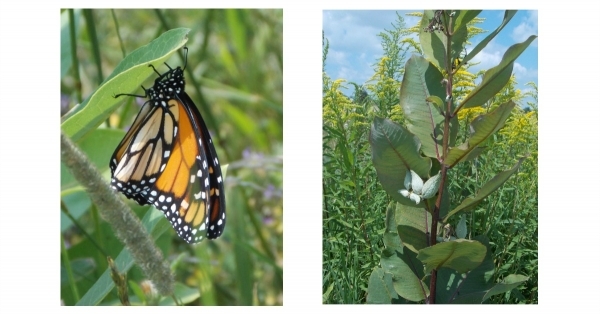 Monarch butterflies love milkweed. The caterpillars eat the leaves and the butterflies drink the nectar. The caterpillars often choose to form their chrysalis on the underleaf of the milkweed. The cup plant stems are very tall at about 8 feet tall. A number of domesticated honey bees can be found on these plants. Burdoch is said to be a "magic herbal remedy". The root can be brewed as a tea.